I picked up a copy of a colourful book with kittens and other cute-art. 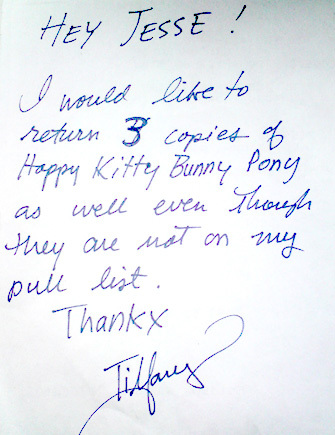 This note had been put in the front cover– perhaps someone thought there were too many copies of happykittybunnypony but with a name like that to compete with art featuring urine or blood or a rope piled in a corner, who could really return them! ?